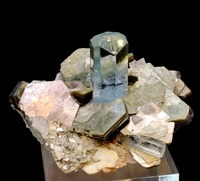 Pale blue transparent beryl crystal, with the usual hexagonal prismatic habit and a complex termination showing at least ten faces. Surrounded by a number of large hexagonal crystals of muscovite. 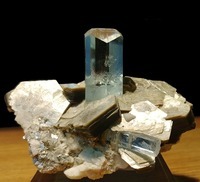 A minor beryl cristal near the right bottom, contacted on the tip. All covering a white compact feldspar matrix. 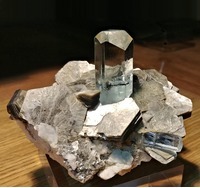 Overall size: 100mm x 88mm x 76mm; main beryl crystal: 38mm tall (visible part) and 20mm wide. Mass: 448g. No damage can be seen with my naked eye and I guess neither with a magnifying glass. 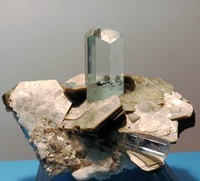 The main beryl crystal is perfect and complete 360º. Probably from Dassu, Braldu Valley, which is an affluent of the Shigar Valley.